Over the past 12 months the team have worked on getting the track to where it is hope u all enjoy it as i had fun making it. The version of this Track will SUIT ALL MODS and also created with photos taken by Frosty 888 and also Race video's online. The Track layout is 2011 version 1.00 also it has the sponsors from this years race. The track its self has some 3D models and in time for rfactor 2. The shadows on the circuit have been turned of as i have not done them yet. Would like to thank all the members at racefactor who took part over the past year on testing the track n also would like to thank Drathuu for his work on the track. For the guys who did the test drives on track would like to thank them for there input Coops ,Mad94d GrimmReaper n all the members who took part in testing of the track and also a big thanks to Pudlea for the last part of the puzzle cheers and big thanks to all who got involved. 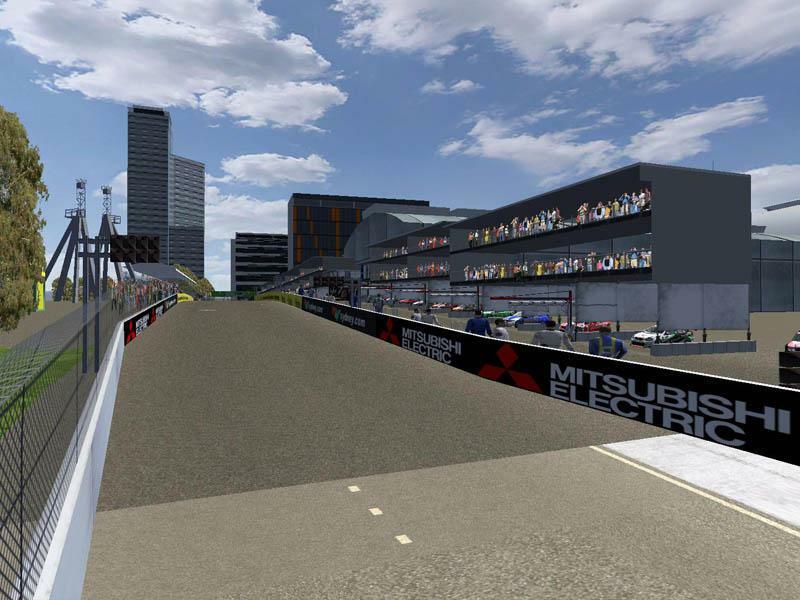 the Tracks models where made by members of Racefactor Modding team and also what was provided by Racedepartment site in xpacks and Anz Staduim was Google 3D Warehouse and worked and fixed by Frosty 888. Guys who worked on the track. Also this track will be Converted in Rfactor 2 when it gets Released and also keep ya eyes out for a mod coming out From the Racefactor Modding Team For Rfactor 2. So to get the new and info about the mod head to the website. Racefactor V8 Series is Heading to the Enduro s want to be part of it Go to www.racefactor.com or add us at RaceFactor FaceBook Group. Feedback is welcome and hope to see what u all think even if its positive or negative. There are currently no setups for RF Telstra Sydney 500. Add a Setup. Most wrong criticism I see made of tracks is by people who don't understand FOV and think that a track is too wide and flat when, in actually, it IS accurate, however, they still want it to be realistic even if they don't understand it the way computer graphics work. spot on with that statement. Cheers dale on your coments and many others and would like to say have a great holidays and be safe and c u all in 2012 wich will be a big year for Sim Racers. "the conclusion we came up with is ppl criticize if too real and"
Cool, but I've never heard of anyone criticizing a track for being too real or accurate. Unless perhaps they are mistaking accuracy for something else. (Well not racing sim fans anyway.) Most wrong criticism I see made of tracks is by people who don't understand FOV and think that a track is too wide and flat when, in actually, it IS accurate, however, they still want it to be realistic even if they don't understand it the way computer graphics work. ...But I am Looking forward to trying this. Thanks. cheers guys and thanks flash n hope to put up some pics of real life track so u all can c the diffrences. Congrats on the track Frosty - good work. Good luck with the rF2 projects and the Racefactor project you mentioned. Yeah I know what you mean What is important is getting it out there and people can use it or leave it (always been our opinion) Dont know how it would be possible to laser scan a temporary track But would be a fun experiment.